Createspace Independent Publishing Platform, 9781535167895, 356pp. From the bestselling author of The Spaceship Next Door: "I don't know how old I am.My earliest memory is something along the lines of fire good, ice bad, so I think I predate written history, but I don't know by how much. I like to brag that I've been there from the beginning, and while this may very well be true, I generally just say it to pick up girls." --Adam the Immortal Surviving sixty thousand years takes cunning and more than a little luck. But in the twenty-first century, Adam confronts new dangers-someone has found out what he is, a demon is after him, and he has run out of places to hide.Worst of all, he has had entirely too much to drink. Immortal is a first person confessional penned by a man who is immortal, but not invincible. 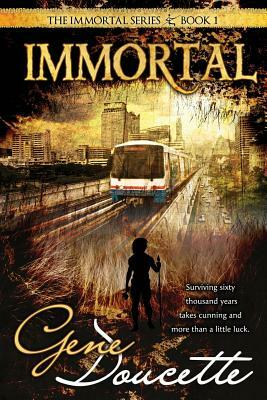 In an artful blending of sci-fi, adventure, fantasy, and humor, IMMORTAL introduces us to a world with vampires, demons and other "magical" creatures, yet a world without actual magic. At the center of the book is Adam. "I have been in quite a few tight situations in my long life. One of the first things I learned was if there is going to be a mob panic, don't be standing between the mob and wherever it is they all want to go. The second thing I learned was, don't try to run through fire." --Adam the Immortal Adam is a sixty thousand year old man. (Approximately.) He doesn't age or get sick, but is otherwise entirely capable of being killed.His survival has hinged on an innate ability to adapt, his wits, and a fairly large dollop of luck.He makes for an excellent guide through history . . . when he's sober. Immortal is a contemporary fantasy for non-fantasy readers and fantasy enthusiasts alike.